Feet can cause us real pain and we may not even know it! We only have one pair of feet and they take us everywhere so it pays to take good care of them, but most of us don’t give our feet a second thought……..that is until they hurt. Once our feet are hurting, most of us have no idea how to eliminate the pain. Untreated this can lead to long term problems, many foot problems are the result of a faulty relationship between the bones and the muscles of the foot. Malalignment can result in a number of problems, commonly flat feet, persistent ankle sprains, bunions, corns, calluses even symptoms that one would not normally associate with feet such as STRESS and PAIN in the back, neck, hips and knees. The foot is made up of 26 bones, 33 joints and more than 100 muscles, tendons and ligaments. We tend to take this for granted until something goes wrong or we develop pain. These conditions can be treated successfully with bespoke prescription orthotics at this equipped state of the art clinic. 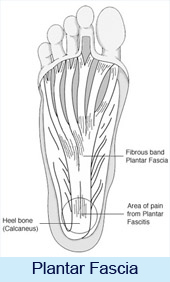 When your first few steps out of bed in the morning cause severe pain in the heel of your foot, you may have plantar fasciitis (fashee-EYE-tiss). It's an overuse injury affecting the sole or flexor surface (plantar) of the foot. A diagnosis of plantar fasciitis means you have inflamed the tough, fibrous band of tissue (fascia) connecting your heel bone to the base of your toes. The causes of metatarsal pain can be attributed to a number of factors, from bone abnormalities to systemic conditions such as diabetes. The most common cause of metatarsal pain is an imbalance in the long bones of the foot. These bones absorb the weight during walking, and if one of the bones is abnormally long or fractured from stress, it will create dysfunction among all bones, causing intense metatarsal pain. MORTONS NEUROMA is an enlarged nerve that usually occurs in the third interspace, which is between the third and fourth toes. Typically, there's no outward sign of this condition, such as a lump. A burning pain in the ball of your foot that may radiate into your toes, also a tingling or numbness in your toes. At first, the pain may worsen when you wear tight or narrow shoes or engage in activities that place pressure on your foot. Over time, though, symptoms may last for days or weeks. The condition may occur in response to irritation, pressure or injury to one of the digital nerves that lead to your toes. 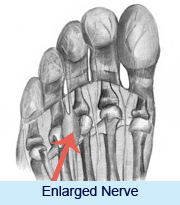 The growth of thickened nerve tissue (neuroma) is part of your body's response to the irritation or injury. Wearing high-heeled shoes or shoes that are tight or ill-fitting, including those that box in your feet and place pressure on your toes. High-impact athletic activities, such as jogging, that may subject your feet to repetitive trauma or simply an injury to your foot. FLAT FEET is a common condition in which the foot doesn't have a normal arch. It may affect one foot or both feet. Most people have a gap between the inner side of the foot and the ground when they are standing. This is referred to as an "arch". Feet that have a low arch or no arch at all are referred to as flat feet or fallen arches and this may be caused by excess pronation. On standing the patient will have a flat arch and the foot may roll over to the inner aspect. Symptoms will vary depending on the severity of the condition. Individuals may experience corns and hard skin under the sole of the foot. The arch area may be tender and shoes may wear out quickly. The condition not only causes biomechanical dysfunction in the feet and ankles but also throughout the body. In some severe cases patients may experience calf, knee, hip and back pain. BUNIONS (Hallux Abducto Valgus) One of the most common big toe problems, often caused by incorrect foot mechanics. The 1st Metatarsal deviates outwards and protrudes from the side of the foot. Footwear then pushes the big toe inwards towards the second toe forming the classic bunion appearance. This condition is quite often associated with flat feet and/or pronation. Orthotics help to control the 1st Metatarsal deviation and reduce the effects of excessive pronation. Noticeable during or after sports activities and common in children aged 8 until their teens. As with knee pain, most noticeable during or after sports activities in children aged 8 until their teens. Provide support. Prevent or halt the development of foot deformity. Provide better positioning. Relieve pressure on a certain area of the foot. Improve the overall biomechanical function of the foot. Improve pelvic alignment. Reduce lower limb torsion and knee stress. © Copyright 2018 Healthy Feet Foot and Heel Pain Clinic. All rights reserved.